The response to an attack on free speech should never be self censorship. Sarcasm and satire are not crimes. Opinion is not a crime. Making fun of religion (easy to do - seer stones, burning bushes, living in a whale, virgins in heaven) is not a crime. Killing innocent people, that's a crime. A drone attack that blows up innocent people at a wedding party most likely generates more terrorists than it kills. One can debate whether it's a crime. 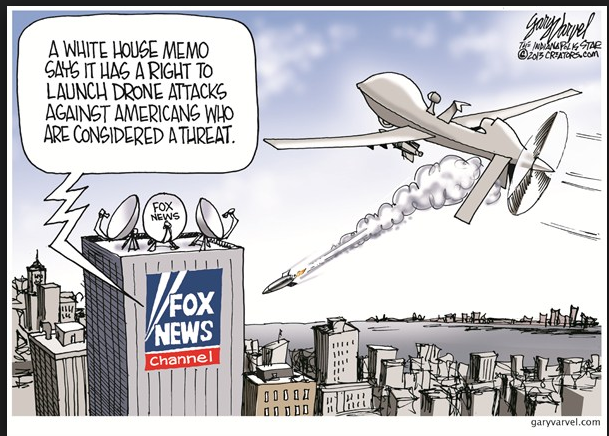 One thing that's certain, the cartoon that addresses U.S. drone policy is not. When innocent people are killed for what they say be it with word or drawing, the response from a news organization should never be self censorship. I remember a dinner years ago in Baku, Azerbaijan when one of the men mentioned his father had been in prison. Another man at the table immediately asked, "what prison?" After being told, he replied, "my father was in that prison too." Both fathers had been in prison not for what they had done but for what they had said. No society is free as long as governments can imprison people for what they say and as long as journalists are freely willing to attend the church of self censorship. That's not a church to satirize or make jokes about; it's a church that needs to close.